As the simulation of war tactics begins during the Signal Hill Tattoo, it is time for the Royal Regiment of Artillery to take the field. Artillery soldiers set up their 6pdr morters on the crest of the hill, while the rest of the Regiment runs the gun onto the field. Once in place, the gun - a 1797 John & Henri King 6pdr Muzzle Loader - is detached from its limber. As the artillery retrieves the ramrod, lintstock, and black powder from their carriage, watch as the mortars fire one by one. Don't veer your attention too far from the cannon however - the thunderous clap and plume of smoke and fire will take you by surprise every time! 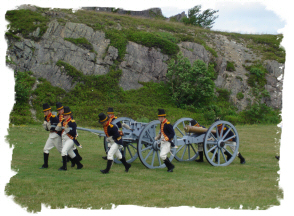 The Artillery performs in the Signal Hill Tattoo every Wednesday, Thursday, Saturday, and Sunday at 11:00am and 3:00pm at the Signal Hill National Historic Site from July to August. Click here for directions to the show, and click here to learn all about the Royal Artillery, its weapons, and its history.